An idyllic family experience, couples' get away, or romantic honeymoon awaits you at the exquisite Hale Manu Kani. 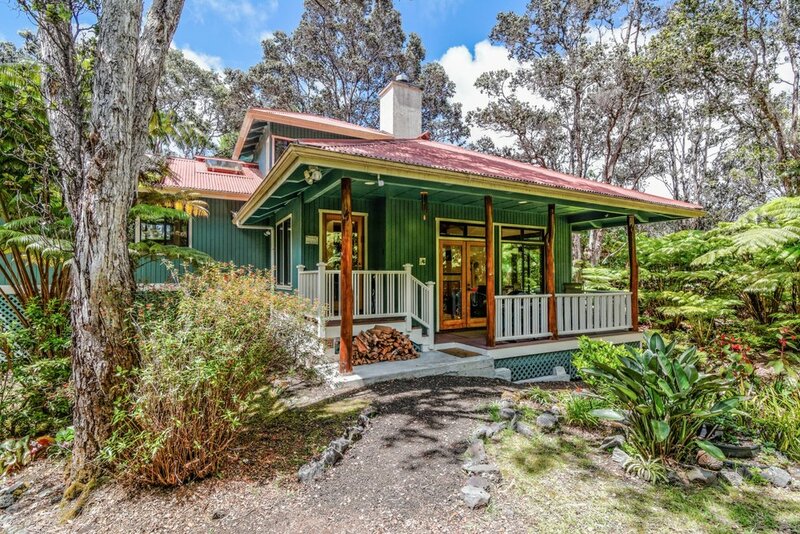 This beautiful home designed by the famous local architect, Boone Morrison, sits on 2.46 acres of lush rainforest surrounded by wild orchids, hap’uu ferns, ohia lehua and olapa trees. 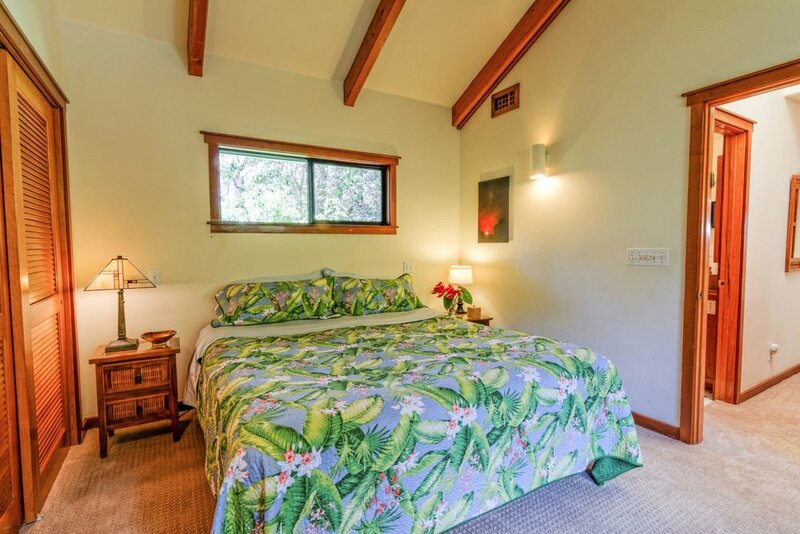 The property is conveniently located in the heart of Volcano Village, a short walking distance to the restaurants, galleries, art center and farmers’ market. 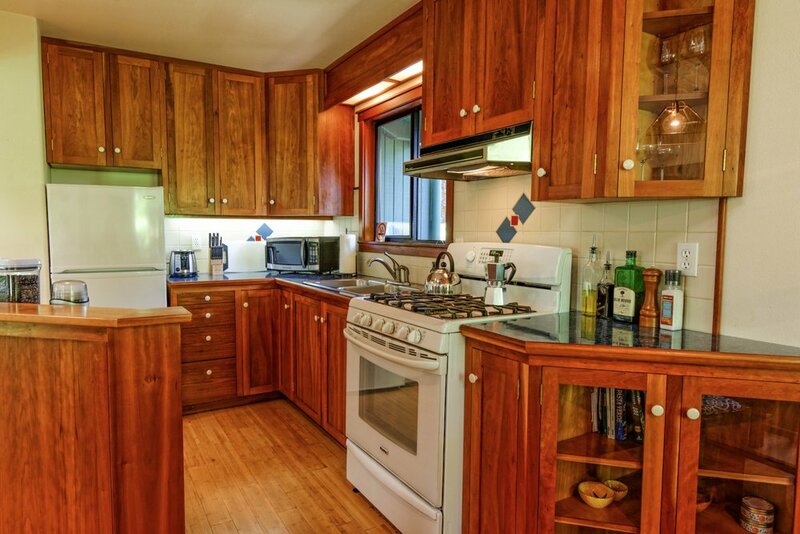 It is also just minutes away from the entrance of the magnificent Hawaii Volcanoes National Park, the Volcano Country Club and Volcano Winery. Spend time relaxing on the lovely lanai overlooking the forest while drinking your morning espresso or evening glass of wine. You many also enjoy a BBQ on the Weber gas grill!! Approximately one half of the expansive property is a beautiful, walkable rainforest providing opportunities for bird watching and star gazing on clear nights. 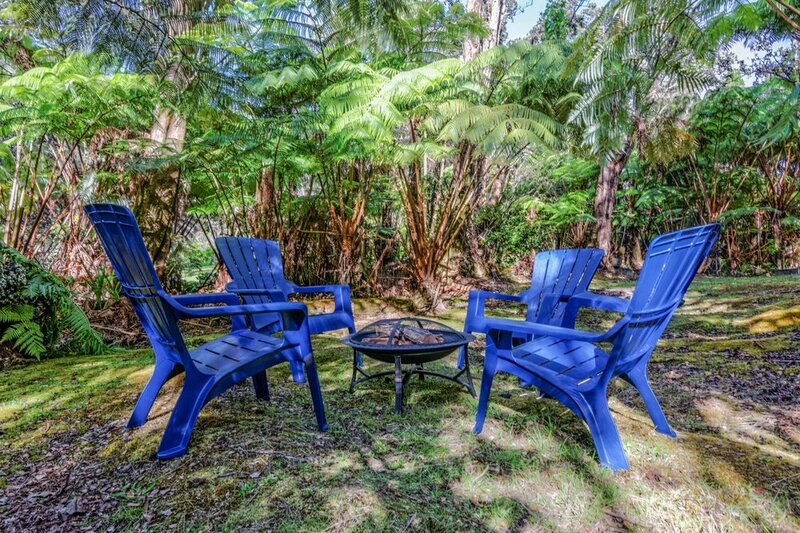 You will enjoy the picnic area and fire pit for roasting marshmallows and making s’mores or simply delighting in the warmth of the fire. 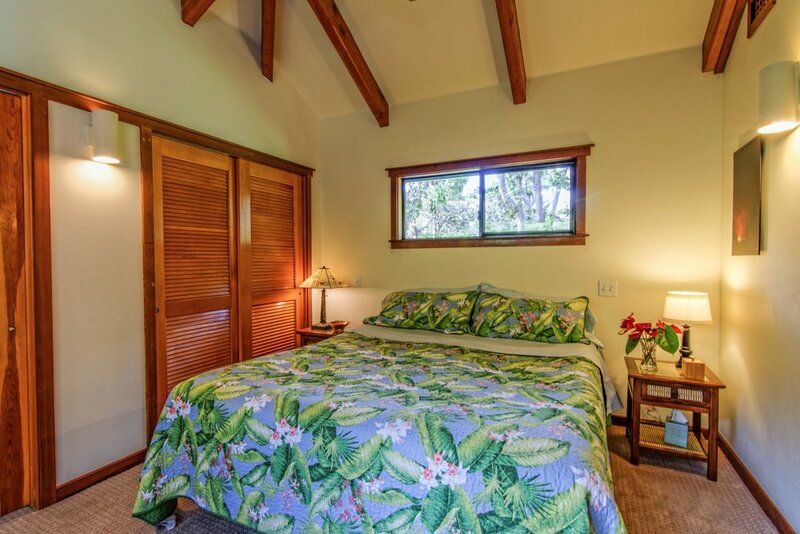 Ultimate comfort awaits you in the California king bedroom, complete with luxurious bedding including high quality sheets, a plush Tommy Bahama comforter, and king size My Pillows. There are two generous closets, as well as 100% cotton spa robes. 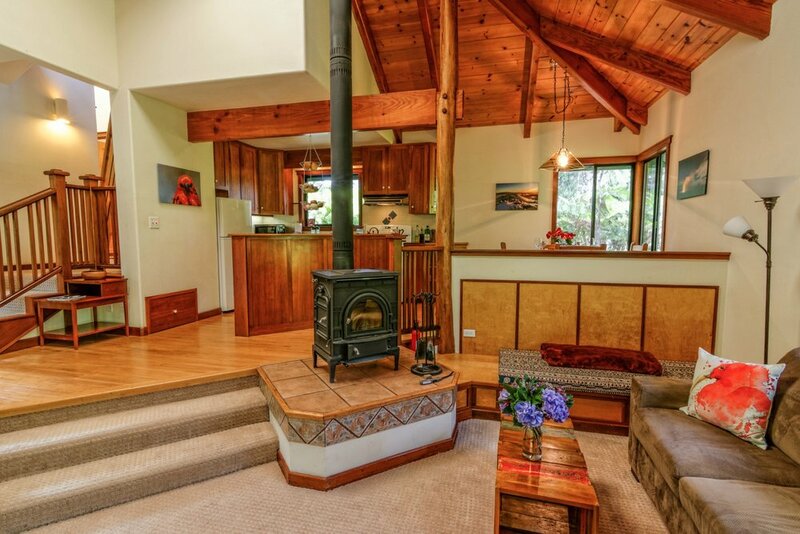 You will feel refreshed waking up to the sounds of the forest. An exquisitely soothing environment that offers serenity with sounds of the wind in the trees and the singing of birds. At the top of the house, with views into the surrounding forest, is a sleeping loft suitable for 1 guest in the ¾ quarter size built-in bed. 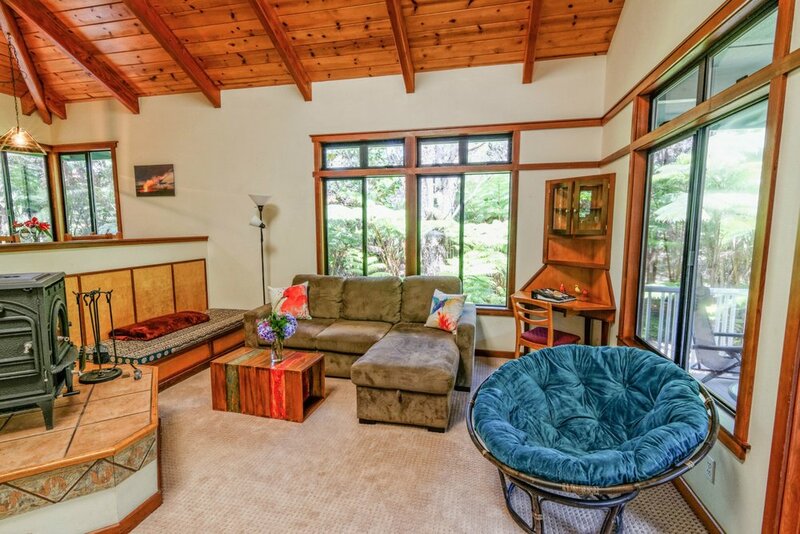 The loft is a relaxing environment to admire the treetop views, read a book, meditate or nap. It is also equipped with a desk, computer monitor, and ergonomic chair and may serve as a tranquil and comfortable work space. The loft is accessible via a hand-crafted ships ladder. The sectional sofa in the living room space opens to a full size bed with luxurious bedding, My Pillows, an electric blanket and Tommy Bahama quilt. 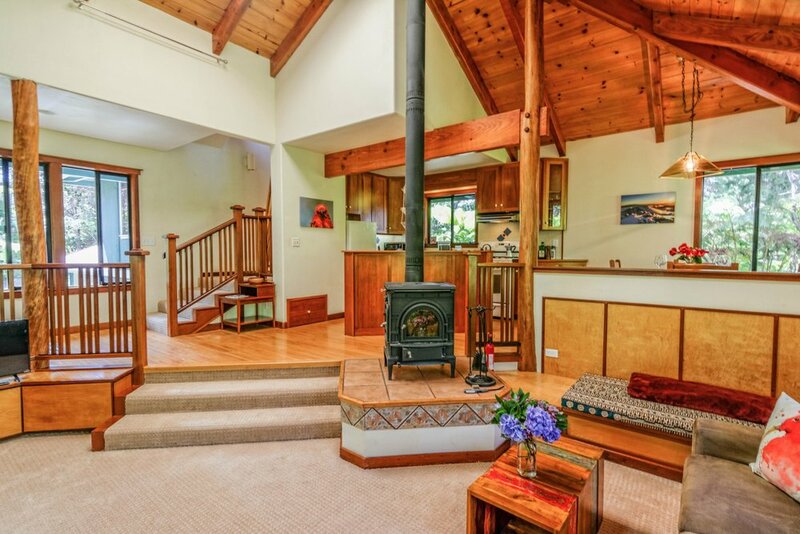 There is a wood stove for cool mornings and evenings. The chef’s kitchen is nicely appointed for guests’ pleasure with all the necessary accoutrements to prepare a casual or even gourmet meal. There is a Bialetti espresso maker, stainless steel hank milk frother and a French press for preparing your favorite coffees. Hale Manu Kani is an idyllic setting which invites you to escape from the noisy, modern world with the luxuries you enjoy. Refresh, relax, reflect with friends and family and be absorbed by the beauty of nature. The perfect retreat! Disclaimer: Hale Manu Kani is marvelous for families, though younger children should be supervised at all times while on the premises. We urge all persons using the ships ladder to do so with caution. Venturing into the “jungle like” portion of the forest is not advised for children or adults. 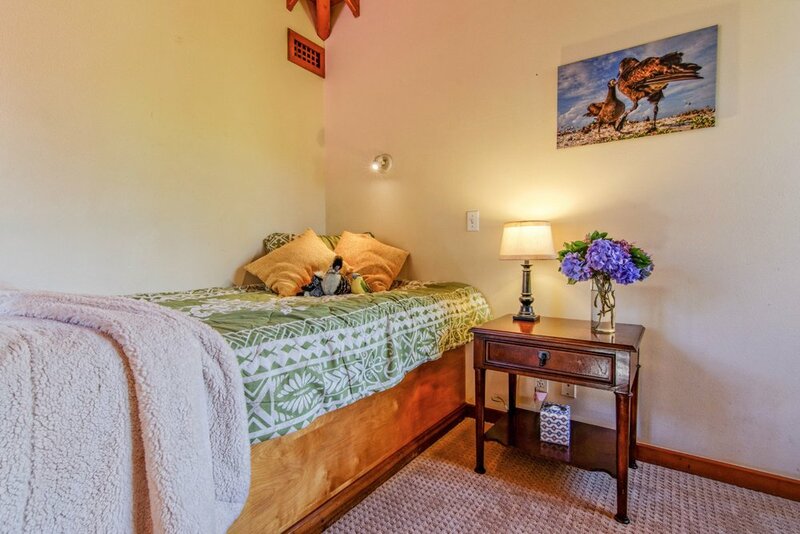 Prices: Low season: $150.00 per night (double occupancy). High season: $165 per night (double occupancy). 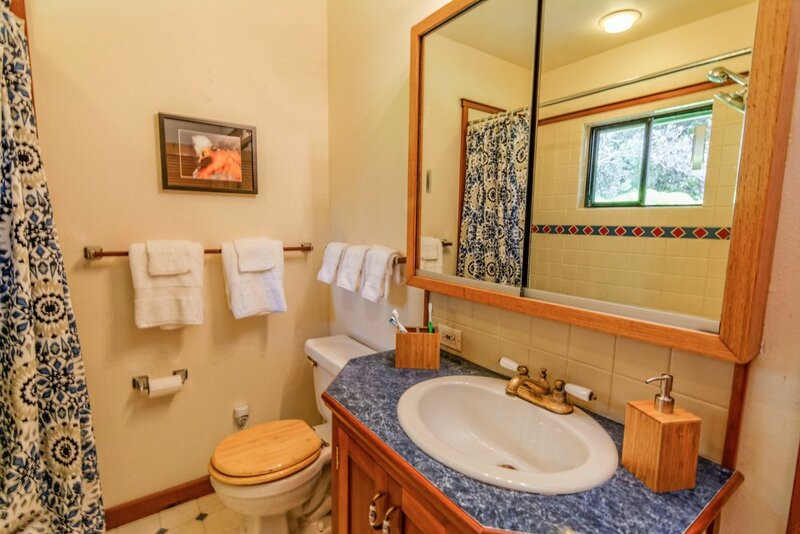 Rooms: 2BD/1BA. Master bedroom with California King, double sofa in living room, 3/4 built-in bed in loft, pack and play crib. Amenities: FREE high speed wireless internet, laptop-friendly workspace, smart TV with cable, wood-burning stove, fire pit with Adirondack chairs, picnic table, marshmallow-roasting forks, BBQ Weber grill, fully equipped kitchen: gas stove and oven, refrigerator, microwave oven, toaster, Bialetti espresso maker, stainless steel milk-frother, French press coffee maker, coffee grinder, food processor, rice cooker, hand mixer, stove top griddle, springform baking pan, mixing bowls, cookie sheets, mandolin slicer, knife set, utensils, dinnerware, glasses, iron and ironing board, luxurious bed linen and Tommy Bahama quilts, bath towels, hair dryer, beach towels, numerous board games and cards, umbrellas and flashlights, fully covered lanai with reclining chairs and cocktail table, triple-filtered water. Laundry: Laundry facilities available for stays of 3 nights or more.